A coordinated effort between DARPA and the Department of Veterans Affairs delivered a revolutionary prosthetic arm system to veterans living with amputation. Credit: DARPAAt a ceremony in New York on June 30th, two veterans living with arm amputations became the first recipients of a new generation of prosthetic limb that promises them unprecedented, near-natural arm and hand motion. 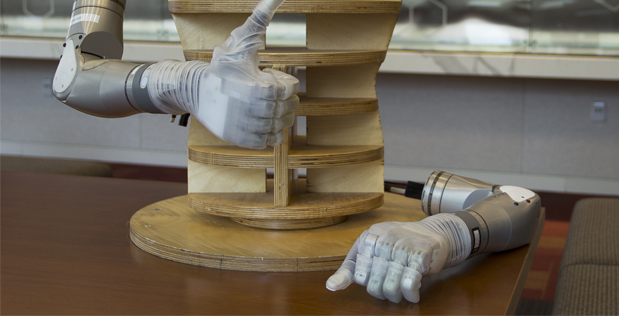 The modular, battery-powered arms, designed and developed by the Defense Advanced Research Projects Agency (DARPA), represent the most significant advance in upper extremity prosthetics in more than a century. The prosthetic “LUKE” arm system—which stands for “Life Under Kinetic Evolution” but is also a passing reference to Luke Skywalker of Star Wars fame, who was endowed with a futuristic bionic arm—enables dexterous arm and hand movement through a simple, intuitive control system. The system allows users to control multiple joints simultaneously and a variety of grips and grip forces by means of wireless signals generated by sensors worn on the feet or via other easy-to-use controllers. Years of testing and optimization in collaboration with the Department of Veterans Affairs (VA) led to clearance by the U.S. Food and Drug Administration and creation of a commercial-scale manufacturer, Mobius Bionics of Manchester, N.H. More than 100 people living with amputation were involved in initial studies, which led to a product whose natural size, weight, and shape provides unparalleled comfort and ease of use. At today’s ceremony, held at the VA’s New York Harbor Health Care System Manhattan campus, VA Secretary David Shulkin presented LUKE arms to Fred Downs and Artie McAuley. Downs is a prosthetics consultant for the Paralyzed Veterans of America and retired Chief Procurement and Logistics Officer for the Veterans Health Administration who lost his left arm above the elbow during the Vietnam War. McAuley is an Army veteran whose arm was amputated as the result of an accident while stationed at Fort Drum, N.Y. He went without a prosthesis for years because earlier-generation devices did not work well for individuals whose loss extended all the way up to the shoulder. “DARPA’s mission within the Defense Department is to make seminal investments in advanced technologies that can have outsized impacts on national security and help those who have stepped up to serve our nation,” said Justin Sanchez, Director of DARPA’s Biological Technologies Office, who manages the Revolutionizing Prosthetics program that developed the LUKE system. “It has been an honor to work side by side with the VA to bring this life-changing technology from concept to capability.” Compared to other commercially available prosthetic arms, the LUKE system has a fully functional, articulated shoulder joint, which offers unprecedented mobility and quality of life even for individuals with total arm loss. DARPA’s work on prosthetic arms continues today through a range of programs, including one that is providing users a natural sense of touch by means of signals transmitted from mechanical hands directly to the brain, and another that is using signals from the brain’s motor cortex to directly control a robotic limb.